If you’re buying a new home but can’t afford one that is move-in ready, you may be interested in a home improvement loan. Or if you’ve been in your home for a while now but have grand plans for repairs and a little TLC, you could also benefit from one of the many types of home improvement loans. Check out what the government is offering in terms of loans to finance repairs and improvements as well as personal loans and refinancing options. These loans are generally used in conjunction with buying a home. Many homeowners who haven’t yet saved up a significant amount of money to afford renovations are attracted to the 203(k) mortgage loan because it allows them to make improvements right away. How does it work? The homeowner can refinance up to $35,000 of their mortgage for upgrades and repairs. 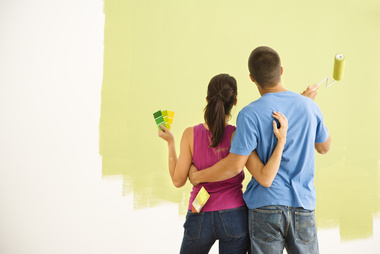 Some homeowners even use it to make improvements before they sell their home to make it more appealing to buyers. This loan is government-backed, so you have to go through an approval process first, which can be somewhat lengthy. This is another government-backed loan and is one of the first options that pops up when you search for home improvement loans. However, it is not as straightforward as it seems. Although the word “improvement” appears in the title, there are actually a lot of restrictions on the type of improvements you can make. Many of the uses for this loan actually apply to nonresidential properties. If you want to make improvements or repairs to a personal residence using this loan, the home needs to have been occupied for 90 days. Title I home and property improvement loans can be used in conjunction with 203(k) mortgage loans. There are literally hundreds of personal loans to choose from. They are mostly unsecured loans, meaning they don’t use your home as collateral. And they require less paperwork than the 203(k) mortgage loan and the Title I home and property improvement loan because personal loans are not backed by the government. You also don’t need to disclose as much information about the type of improvements you wish to make in order to secure a personal home improvement loan. A personal loan might sound more attractive at this point, but keep in mind that personal loans typically come with higher interest rates than their government-backed counterparts. Refinancing: This entails taking out a second mortgage. Home equity loan: Your home backs up the loan and the amount is determined by the value of the property. Home equity line of credit: A lender gives you a set amount of money that you can withdraw from and you pay interest only on the amount that you use for your home improvement project. If you’re interested in any of these options, talk with a lender to discuss your unique situation. And as always, give us a call at any time if you have questions or concerns.